Technology has been and will remain the biggest driver of change in the world, and in retail. But it doesn’t have to mean spending lots of cash by investing in crazy, expensive, innovative technology. We attended Spring Fair in February, and eagerly sat through Cate’s talk on retail trends for 2019. As the Head of Trends at Insider Trends, Cat was named the 40th most influential person in retail internationally. Her observations on the retail marketplace are eye opening and definitely worth a read. The high street isn’t dead. It’s regrouping. When opening their Regent Street store back in 2012, Burberry shook the retail world. Because of the technology used within their retail environment, it revolutionised everything. Full of interactive screens, immersive multimedia content and digital rain showers – they called it a truly ‘future proof’ space. In September 2018, they made an announcement to refurbish the store. Now, most of the technology has disappeared, the amount of stock has been significantly reduced and the space has been taken over by an art installation. The new Burberry store – albeit not filled with technology, it’s been designed with technology surrounding the store. The focus is on getting visitors to use their phones to interact with store. Burberry also host in-store catwalk shows, take 360-degree photos and play music. They have now created a space that attracts technology. The space encourages the use of technology by the customer, rather than a shop that is full of it. For so long, brands have made the store the heart, solely supported by the website, social media, email and advertising. The landscape has changed and developed, and now within a digitally led ecosystem there’s no way from getting away from technology. Today’s consumer now may begin the journey online, discovering your brand through social media advertising. Their interest is peaked, and they continue engagement on your website. Then, a last step through social media for validation – finally making the decision to visit your store for their final purchase. Today’s customer expects a consistent experience across each and every touch point.. Easier said than done right? As a result, retailers can no longer look at their online and store operations in silo, but combine the experience across all social channels, website, in store and advertising. They have made sure that customers who are buying digitally, get the same service that customers visiting the store do. Every month the Matches Fashion store changes their focus and features a new brand. They also have a cafe in-store where ‘conversations’ are filmed and recorded, featuring a personal stylist that’s often also a social media influencer with their own separate following. It’s a clever way for the customer to engage with the brand across all channels, and feel special whichever channel you choose to use. The ‘new store’ now plays a part in a multifaceted system. 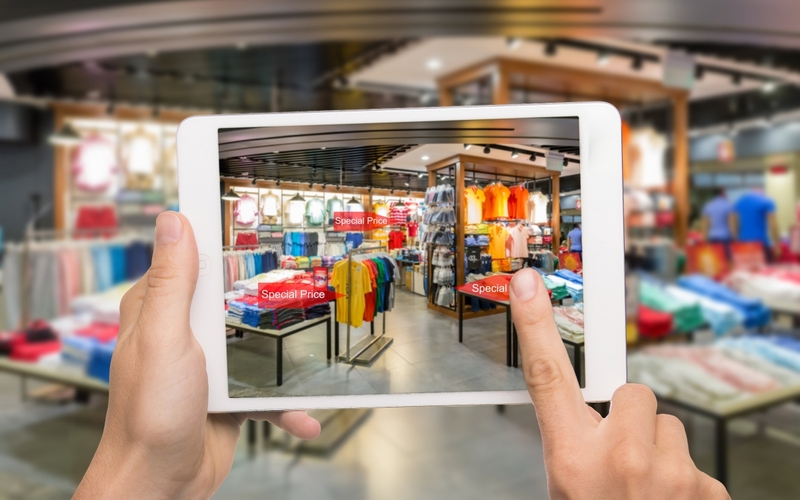 Businesses can utilise their stores to build meaningful relationships with customers and create unique personalised experiences that encourage brand loyalty. According to research made by the Boston Consulting Group, “Brands that engage customers emotionally are able to both charge customers more, and sell more. By engaging all five senses, and bringing the brand to life through staff and service, physical spaces will always be king of the emotional connection”. As an example, Vagabond Wines have designed an in person experience that digital cannot offer. In part, the venue is a bar and you get given a card which you load with credit. You can pay for the taster or normal glass with your card, and if you like it, you can buy the bottle. Their way of combining the two is proving beneficial as up selling works, as well as creating a unique experience. Sweaty Betty’s new store in central London has been completely turned on it’s head. It now contains a small area for their store, and also offers blow-dry bar, a fitness studio, and cafe. The ‘store’ now engages with customers without forcing them to buy Sweaty Betty clothes immediately. The aim is to build relationships between the brand and the customer, and increases general footfall. Nike and Amazon are two of the world’s biggest brands, and lead the retail marketplace with their technology driven campaigns. Albeit their billion pound marketing budgets and huge teams, the thought behind their campaigns is relatively simple. Amazon have been testing pop-up stores in the US, but their 4* popup store in New York is unique in many ways. They have used purchase & user data from across wider New York area to create a store filled the store with ‘best sellers’ and ‘most wished for’ products. Nike picked their top ten best sellers and categorised them clearly in their new New York store, showing customers visiting the store what the most popular products are. The tactic also makes it easier for the customer to find what they’re looking for. “If you know what you want to buy, you buy it online. If you’re looking for inspiration, you go into the real world” – Steven Godfrey, Director, Rough Trade. Consider self-checkout, self-scanning and web mobile site based checkouts. Customers are comfortable with high technology based checkouts, so encourage your staff to improve the customer experience, rather than hang out by the tills waiting for purchases. 30% of iPhone customers now use Google Pay, and 57% of British people prefer a non-human interaction when shopping. Sales assistants now have the opportunity to enhance customer experiences, tell stories of the products, offer more value than what a computer can do. It really shows the value of the products and the brand. Harvey Nichols now works with a software called Hero that helps connect their online store with the offline store through photography. Renamed ASKHN, they have now seen a 10% increase in conversions, 63% increase in spend and 50% more customers are now likely to keep their purchases. Customers are also 3x more likely to visit the store if they’ve used the service. Think about how you can get customers to spread the word about you online. If you have an online store and a shop, consider using the message ‘discover more of the range online’ in store. It’s a key message for all retailers and can help direct traffic online. Social media is a fantastic platform to create that buzz and increase brand awareness. The saying ‘most Instagrammable’ food, restaurant, cafe and shop has become a ‘thing’. With hundreds of articles and searches bringing up places for Instagram-worthy photos, and businesses now focusing on creating Instagram-worthy products. Peggy Porschen, a cupcake shop in London is a prime example of a cafe who’s space has turned into an Instagram hotspot! Nordstrom has had a traditional store format of approximately 50 years, but have recently invested in different physical spaces based on data-driven results. Personal styling, cafe, nail bar, tailor, and much more, helps customers engage with them in store and online. On average, the customer spends 5 x more and profitability per customer doubles. The interaction between online and offline is driving loyalty and because of that, repeat orders. Think about IKEA now. For years they have been a step ahead of the curve, offering the customers with experiences in each an every store. Recently, however, they have opened a new store on Tottenham Court Road, focusing on enhanced customer service and digitalisation. If they can break away from their winning strategy and keep evolving, then any business can. Earlier this year IKEA broke tradition a second time, with a TV advert called ‘The Nightclub’. Cleverly executed and with a strong message, they are engaging with a younger audience through a channel applicable to them. Explore additional channels, how can you improve your offering across all channels? Utilise user data, social media statistics and customer behaviour in store. It might give you a better understanding of your customer, who they are and what product they’re interested in. In the long run, this might mean your product offering changes to meet the customers evolving needs and interests.